Jobs Description: Pakistan Hunting and Sporting Arms Development Company Jobs 2018 are listed below in our site. Pakistan Hunting and Sporting Arms Development Company is a Public Ltd Company u/s 42 of the Company Act, 2017 (Company Ordinance 1984) as a subsidiary of Pakistan Industrial Development Corporation (PIDC), Ministry of Industries & Production (Mol&P) Govt of Pakistan. 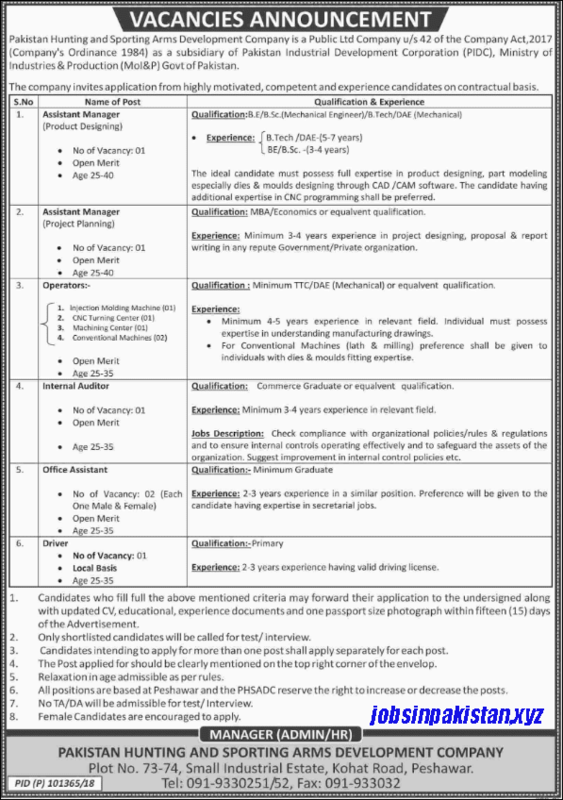 Pakistan Hunting & Sporting Arms Development Company Peshawar has required the applications for following jobs. How To Apply: The interested candidates may submit their application forms to Pakistan Hunting & Sporting Arms Development Company Peshawar.